Rihanna has become a staple in the sports world, and people love it. From her bold opinions to her always-on-point court-side style, Rihanna is a fan favorite. And while her team loyalties seem a bit unclear at times, she does one thing that makes her OK in my book—she shows up. Let’s talk about a few other reasons why Rihanna is the best and why the sports world generally digs her. Rihanna was rumored to have dated J.R. Smith in 2012. In 2013, someone apparently had the audacity to blame his poor postseason play on the songstress via social media. According to Peter Botte of Daily News, a comment appeared from her Instagram account in response to that allegation—the comment suggested Smith played poorly not because of her, but because he was hungover. Rihanna was in attendance at a 2014 playoff game between the Oklahoma City Thunder and Los Angeles Clippers, because of course she was. 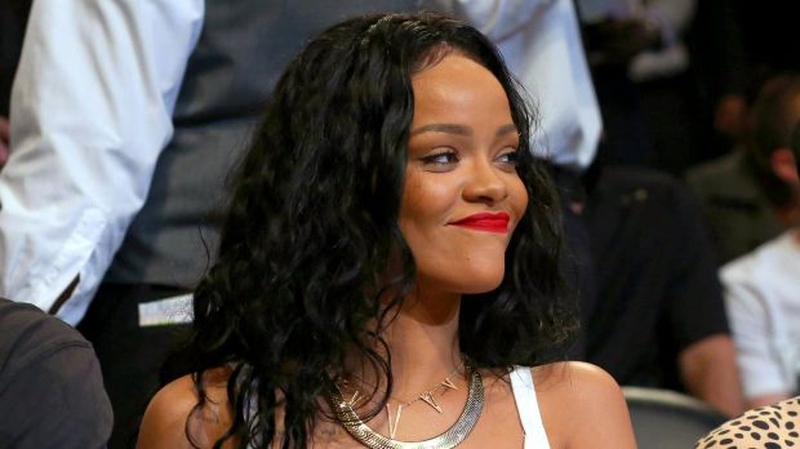 During the game broadcaster Jeff Van Gundy joked about the possibility of Rihanna stalking him. When Lisa Salters asked her about it, Rihanna had to ask who Van Gundy was. It was all lighthearted, and it was great. Olympian Lolo Jones made the huge mistake of dissing Rihanna on Twitter in 2014. Rihanna had previously been linked to Drake, and the tweet referenced the rapper's gig as ESPYs host. It read, "It's amazing that Drake is hosting the @Espys but it's gonna be tough for him to hand out all those awards to Rihanna's ex boyfriends." It's true that Rihanna has been romantically linked to multiple athletes, but Jones was out of line, and people let her know. TMZ recently reported that companies might offer celebrities like Rihanna free tickets to the Floyd Mayweather/Manny Pacquiao fight—with a caveat. The stipulation is, said celebrity must agree to wear company logo'd apparel ringside to nab the free ticket. According to TMZ, VOCO Vodka and Coconut Water have made such offers to Rihanna, Will Smith and Leonardo DiCaprio. Rihanna isn’t one to go with the grain just to go with it. During the 2014 World Cup, the star made headlines by not rooting for the U.S. team.Granted, Rihanna is from Barbados herself, but Rihanna publicly rooted for both Brazil and Germany. It didn’t stop there—she tweeted up a storm throughout the tournament, giving her opinions on everything from Luis Suarez to FIFA in general. She may be a little all over the place, but you have to credit her boldness. Like I said, Rihanna has been romantically linked to several athletes, including MLB star and ex-boyfriend Matt Kemp. Besides that, there is no shortage of professional athletes that simply wish they had a shot with her. Joel Embiid has made it well known that he has a crush on Rihanna, as have Sam Dekker and Jadeveon Clowney. Recently, Embiid sent her a happy birthday message via Twitter, promising to take her to Giorgio’s in Los Angeles. So romantic. Rihanna always dresses to impress, or to surprise, or maybe she doesn’t care at all what people think. Either way, from pink hair to killer kicks, RiRi always looks good sitting court side. The home team wins 66.7 percent of the time when Rihanna is in attendance, 60.6 percent when she is not. Kevin Durant averages 35.5 points per game when Rihanna is there, 31.56 when she is not. Dwight Howard hits 64.25 percent of his free throws with Rihanna watching, 56 percent without. Odds are, RiRi has nothing to do with any of this, but it's a fun concept.